So... it's been two and a half years since I confessed that I hadn't read any Jane Austen. I thought I would give you an update. 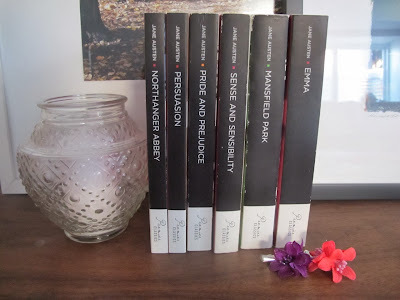 I've read three now - Sense and Sensibility, Pride and Prejudice, and Mansfield Park. Phew. Here is the next shocking confession: I didn't particularly like them. Now, I didn't hate them, but I certainly didn't love them. And I expected to love them. When faced with an evening alone and the TV to myself I search for a period drama. I love Downton as much as as anyone else (and boy are there plenty of parallels between Downton and Austen). I adored all the Bronte books when I read them. But, at times, these three Austen books were a bit of a slog to get through. I finished Mansfield Park at some point last winter and decided to take a break from Austen. I'm not dismissing their value as literature of the the English language, nor the enormity of their story and the fact that they were written by a woman. There were, however, many, many times that the detail was intense and the plot very, very slow. More than once I wished the BBC had done a miniseries on all of the books. You know what? I think I would have loved these if I read them in my 20s. When I had a romantic view of romance and still thought drama in a relationship was admirable. I too was daydreaming of marriage and that being an end result as opposed to a beginning. Now, approaching 40, I consider it romantic when my Hubby empties the dishwasher and drama means The Evil Genius thinks the world is out to get her again. Don't worry, I'm not giving up. I will finish the other three, maybe even this year. I've got lots of tea on hand. Our perspective on what makes our heart go "pitter-patter" does so change with age! That made me smile. I am almost 60 and get very annoyed by novels with weak willed, giving up everything for a man - main women characters - I want to smack them and say "use your brain". I adore the men in my life, don't get me wrong - been married to DH for 33 years and he is my only sweetie. but I agree - cleaning out the dishwasher, or changing my car battery - makes my heart sing!! Oh Cheryl, I am on your team. I too, struggled to read Austen and gave up at one point, a rarity for me. I did however just finish 'Longbourne' the story of the house staff from Pride and prejudice. Loved it, couldn't put it down. Strange eh ? I didn't ever love Austen before, either, but I'm giving this group a try - maybe you'll like it, too! Oh, but the BBC *did* do versions of all of the books (and the 1980 version of Pride & Prejudice is SO much better than the Colin Firth version). The box set is even available on Amazon. I grew up watching these, and love them all (except Northanger Abbey - I can't get behind that one). The thing about Austen is that she's not particularly romantic, and the descriptions of weak-willed women (and men!) are satire. It's interesting that you thought they were a slog - Henry Longfellow's review of them was that they were great for readers who preferred not to use their imaginations and to have everything described in detail. re-read pride and prejudice last year at the same time as my 13 yr old daughter read it for the first time, and then I took her to the play at Theatre Calgary. We just loved the word play, and how often Lizzie is laughing or poking fun at others and they don't even notice. I'm with you 2 years ago. I still haven't read them and feel guilty about it! I started doing one "on tape" and still didn't make it through. I was with you on the weak willed women. But maybe hearing they are satire now I could do it? I find them hard to read all the way through as well. I actually listen to them as audiobooks while I am sewing or on a long car ride (or when I worked in data-entry). You get the whole book in 6-8 hours, the description goes by so much faster when you aren't reading the same sentence over and over, and it you get all the jokes just by the narrator's tone of voice, no more looking up obscure 18thC etiquette! Your comments on Jane Austen made me laugh because while I love her books I have a friend who can't stand them and will go on a tirade whenever they are mentioned. Pride and Prejudice is my favorite although I think Emma is her best book. Forget P&P with Colin Firth - BBC did an earlier version titled "Pride and Prejudice, or First Impressions". I believe it is on Netflix and was first made in late '70s or early '80s. And don't get me started about P&P with Keira Knightly which I happened to catch a few minutes of on TV one night. She plays Elizabeth but prances around like a twit - I don't believe the director ever read the book. I watched about three minutes of it, screamed, and turned off the TV. Do give Emma a try. I read P&P many years ago. Love the movie versions, have seen the mini-series, and the one with Kiera Knightly. Loved Emma. S&S was great too, I saw the one with Emma Thompson. Mansfield Park, not so much. I really have to go get my copies and try to read them again and see what I think. I'm pretty much with you on Austin. My daughter and I decided recently to read them together. We both made it through Pride and Prejudice and Persuasion but neither of us could get through Emma so we just watched the movie. I'm finishing Northanger right now. What we did really enjoy though is the modern movie The Jane Austin Book Club. I'd recommend it even if you're not an Austin fan. Im a brit and have neverread them altho they were on the essential reading list given to me when I started Grammar school way back in the early 1960s. I have read few of the classics on that list come to think of it! Romance was the idea in a relationship back in the day wasnt it but its a relative concept and thoughtfulness, kindness and respect are far more worthy things to hope for!